The unusual exhibition, entitled Novecento mai visto (The 20th century as never seen) before, includes some 230 works by around 110 international artists, which range from 1909 up to now. Alongside classic examples of Constructivism and Concrete Art through Minimalism and Conceptual Tendencies the exhibition will also present installations, photographs and videos by renowned contemporary artists. The exhibition is further enhanced by two new commissioned works by Nic Hess and Luca Trevisani, which will appear in specific areas of the museum. Alongside the Daimler exhibition there will be another exhibition dedicated entirely to Italian art, which is titled From De Chirico to Cattelan, featuring works of the last century, which have been acquired by public and private collections in Brescia. In the history of Museo di Santa Giulia, Novecento mai visto will be the first comprehensive presentation of contemporary art. Novecento mai visto is an exhibition project conceived by the Daimler Art Collection, which was founded in 1977. The internationally renowned corporate collection comprises some 2000 works focusing on the abstract avant-garde, young media artists as well as commissioned works around automobile themes and includes 30 large-scale sculptures in various publicly accessible locations. It focuses on the area of twentieth-century Abstract Art: from the circle of artists around Adolf Hölzel in Stuttgart in the nineteen-tens, Bauhaus, Constructivism, Concrete Art, the European ZERO avant-garde, Minimalism, Conceptual tendencies, and Neo Geo, all the way to the most recent contemporary art. The collection has so far been seen in temporary exhibitions in international museums among others in Singapore and São Paolo, Tokyo, Cape Town, Johannesburg, Buenos Aires and Vienna. In the beginning of 2012 the Mercedes-Benz Museum Stuttgart started a strategic partnership with the Museo Mille Miglia in Brescia, which aims to highlight their common passions in Car Culture. Since then the Mercedes-Benz Champion Cars have been exhibited at the Museo Mille Miglia in spring 2012, and on October 9, 2012, the opening of the exhibition "Mille Miglia - Passion and Rivalry" has been celebrated in the Mercedes-Benz Museum Stuttgart. This cooperation also includes joined activities with Museo di Santa Giulia, the leading arts institution in Brescia, followed by the obvious initial idea to showcase some highlighting art works from the Daimler Art Collection in Brescia. The Museo di Santa Giulia is housed in the historical complex of a former monastery and is unique throughout Italy and Europe in terms of its design and location. The Novecento mai visto exhibition by the Daimler Art Collection will strengthen the links between the partnering institutions, namely Museo di Santa Giulia, Museo Mille Miglia, Mercedes-Benz Museum and the Daimler Art Collection. The Museo di Santa Giulia offers an itinerary through the history, art and spirituality of Brescia from pre-historic times to the 19th century and further through Italian classical and postwar tendencies. The holdings of the Daimler Art Collection will close the circle from pre-historic relics to recent and actual art trends. This will create a unique cultural event for the City and the wider Province of Brescia. The unique Museo di Santa Giulia in Brescia is a recently added UNESCO World Heritage site. The museum is a monastic complex of Lombard foundation - and with display areas covering 14,000 m², offers a journey through Brescia's history, art and spirituality from prehistoric times to the present day. The former Benedictine convent of San Salvatore - Santa Giulia was founded in 753 AD. The complex site is composed of parts from many different epochs: a stratification of memories and a continual source of unexpected discoveries. It was built on the ruins of impressive Roman town houses and includes the Lombard church of San Salvatore and its crypt, the Romanesque Santa Maria in Solario, the Nuns' Choir, the sixteenth-century church of Santa Giulia and the monastery cloisters. As starting point for the exhibition Novecento mai visto will serve some masterpieces from Classical Modernism, with important works from the German Bauhaus, from Constructivism and Concrete Art, e.g. by Josef Albers, Willi Baumeister and Max Bill, who are key artists of the Collection. Other representative names from these times are Adolf Hölzel, Oskar Schlemmer, Adolf Fleischmann, Jean Arp, Richard Paul Lohse, Herrmann Glöckner and Georges Vantongerloo. In the beginning art historic sections the exhibition will present masterworks from the time side by side with contemporary positions, who refer, reflect or relate to these artistic predecessors. This presentation is attempting to create a referential dialogue between the works and to reveal discursive links between individual formal ideas and subject matter over time. The second part of the exhibition is dedicated to the European ZERO avant-garde. This movement is linked with artists like Heinz Mack, Enrico Castellani, Dadamaino, Getulio Alviani, François Morellet, Jan Schoonhoven, Klaus Staudt and Jan Henderikse. 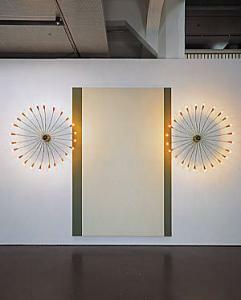 ›ZERO‹, founded by Heinz Mack and Otto Piene as an artists' association in 1957, became a European movement in the 1960s. By questioning the basis of artistic production, reception and presentation in general the artists redefined the traditional concept of the work of art radically, thus laying a foundation for the Concept Art and Minimalism in Europe. Another part is glancing on conceptual tendencies from the 1960s up to the today. The intellectual and factual proximity of works by Joseph Kosuth, Marcia Hafif, Daniel Buren, Bojan Šarcevic, Alicja Kwade and Liam Gillick allow the visitor to follow the fundamental moments of Conceptual Art: its emphasis on system and series, dematerialization and processuality, rationality/irrationality of the idea of the work, parameters of the artwork, the involvement of the observer and art as language - language as art. Another expanding focus of the Daimler Art Collection is on new media art, including photography, video and multimedia-installation, which are frequently committed to socio-critical, political and cultural issues of contemporary society, as for example the works by Berni Searle, David Goldblatt, Pamela Singh, Sigalit Landau, Alfredo Jaar and Santiago Sierra. The final section of the exhibition deals with commissioned works relating to the automobile. In 1986, on the 100th anniversary of the invention of the motor car, Daimler-Benz AG asked Andy Warhol to look at the motif of a car as an icon of mobility. About 80 pictures were planned for the Cars series, but only 35 pictures and twelve drawings were completed before he died in 1987. This complex provides the origin for other car-related work commissioned by Daimler, e.g. by Robert Longo, Simone Westerwinter or Sylvie Fleury. Fleury produced a series of six impressive video works for the new Mercedes-Benz Center in Paris. In each of her 3-channel projections, the artist blends the appeal of legendary Mercedes-Benz cars with the latest contemporary ideas from the worlds of art and fashion in an approach that is as enigmatic as it is elegant. This section will be completed with other car-related sculptures, objects and videos by Richard Hamilton, David Hockney, Kirsten Mosher and Vincent Szarek. A unique key component of the exhibition Novecento mai visto is a comprehensive educational program for school and college students in Brescia, which will be developed in collaboration with the education department of the Museum. The aim of the program is to examine the content of the exhibition, its works and artists as part of school lessons or studies. Students will receive a 200-page book for free about the exhibition, developed by Daimler's Art Collection department, which features 60 color illustrations. The educational program also includes a guided tour through the exhibition. In the run-up to the exhibition, museum employees, teachers, professors and art history students will be trained to provide their young audience with key information and a lot of interesting details. A shuttle service can possibly be set up by Mercedes-Benz Italy to transport students from their schools to the museum. With this offer to the schools and higher education institutions in Brescia, the Daimler Art Collection wants to offer an important and sustainable contribution to art education. As well, the education program will add to the school curriculum subjects that deal with contemporary European and international art from early 20th century art up to today, focusing on abstract tendencies, car related art and contemporary photography and video art, questioning critical actual issues. This means that this educational program could be the first time that many children and young people will come into contact with these tendencies of 20th century and contemporary art.